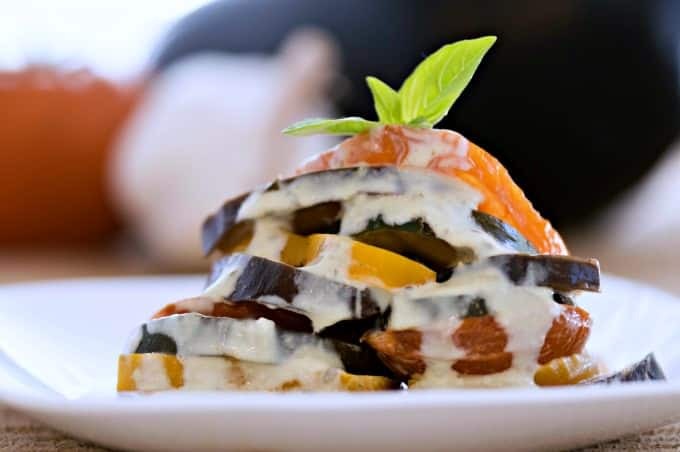 This Garden Ratatouille with Fresh Basil Cream Recipe is a visually stunning twist on a classic dish that gets elevated to gourmet with lashings of a silken herb-infused sauce. It’s also a fantastic way to deal with a garden that decides to put out more vegetables than you can possibly eat in one meal. We got an early start on the planting season this year thanks to a mild and brief winter. So, while it was lovely picking fresh spinach and lettuce in the garden in early March, that also meant other things peaked two months early, too. Ordinarily, I can count on August’s heat to keep my zucchini, pepper, tomato, and eggplant bushes going strong. Sometimes, it’s all I can do to keep up! Not this year, though. I was harvesting in early June, and by early August the weather had cooled so much that my plants stopped putting out blossoms. Fortunately, the last tomatoes, zucchini, and eggplant came in just as the lone bell pepper was ready to pick. Seriously, I usually have so many of those that I start giving them — along with extra zucchini and baskets of Zucchini Muffins with Sugar Crumb Topping — to neighbors until they beg me to stop. This year? I got one bell pepper. One! It was a beauty, though. Meanwhile, my herb plants are going crazy. We’ve taken to calling that part of my garden The Herb Jungle because the thyme is running rampant and almost looks like a lawn at the base of the basil and parsley plants. I’d planted lots of herbs to attract bees, and they are loving it! Now, traditional Ratatouille originates from Nice, France where it was made as a simple, one-pot stew on the stove and is flavored with herbs de Provence because Nice is in Provence, of course. There’s some food history which indicates its name comes from the French slang “rata,” meaning chunky, and the word “touiller” which means “to stir up.” And that would perfectly describe traditional ratatouille which looks like a big ol’ pot of chunky vegetable stew. 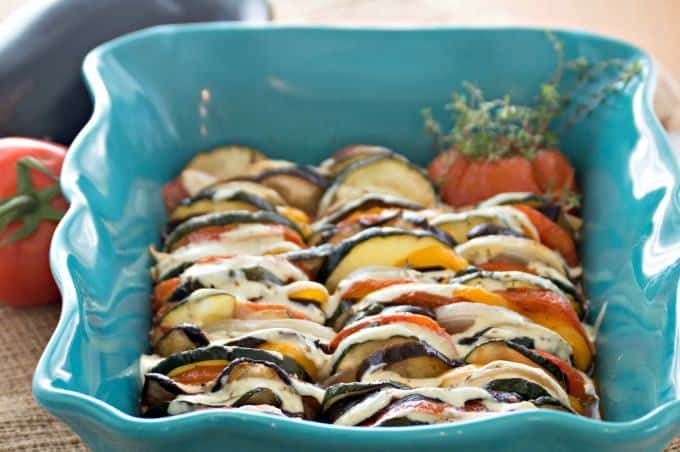 But in the Age of Pinterest, the rustic origins of classic dishes are giving way to prettified variations and Ratatouille is no exception. 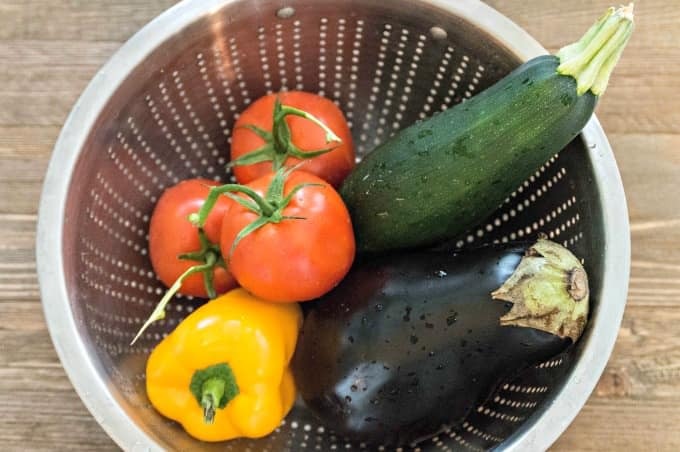 So, for this Garden Ratatouille with Fresh Basil Cream recipe, I opted to slice the vegetables thinly — a task made much easier with a mandolin slicer. Once you’ve sliced the vegetables, spread the seasoned tomato sauce in the bottom of a casserole dish and alternate the vegetable slices as you tuck them in. Drizzle the whole thing with high-quality olive oil, salt, pepper, and fresh thyme leaves. A layer of parchment paper cut to fit on top of the vegetables while they bake will keep them looking vibrant. Don’t fret if you run out of vegetables before filling your dish. I solved that problem by coring a tomato and inserting thyme sprigs. It added a nice visual accent and, wow, did it taste good, too! While the ratatouille bakes, make a roux in a small saucepan and cook it for 1-2 minutes then slowly whisk in some heavy cream and, lastly, some freshly minced basil leaves. Simmer this until it starts to thicken a bit, season with salt to taste, and remove it from the heat. 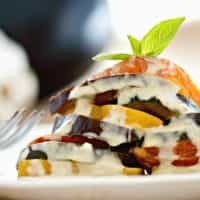 Spoon half the sauce over the ratatouille when it comes out of the oven and use the rest to top individual servings, garnished with a basil leaf, for a gorgeous presentation that makes eating your vegetables feel gourmet. A visually stunning and delicious twist on the classic chunky vegetable stew. Remove from heat and pour the sauce into the bottom of a casserole dish. Wipe out the pan and set it aside. 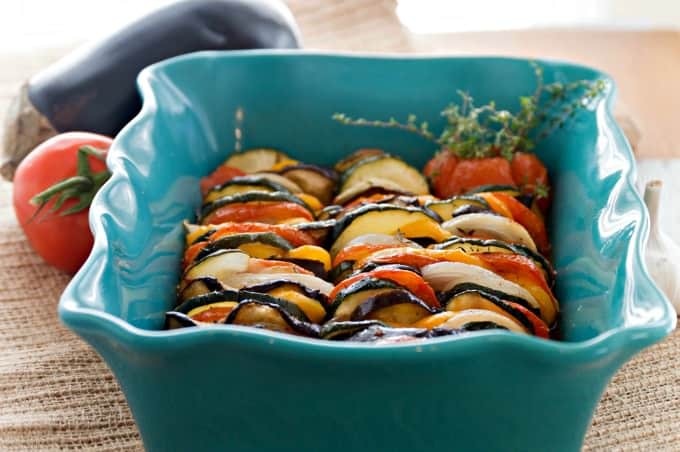 To the casserole dish, add the pepper, tomatoes, zucchini, and eggplant in alternating, vertical layers. Drizzle with remaining olive oil, season with salt and pepper, and sprinkle with the fresh thyme leaves. Cover loosely with parchment paper and bake at 350°F/ 177C / gas mark 4 for 30 minutes. While the ratatouille bakes, place the saucepan used to make the tomato sauce over medium heat. Add the butter and let it melt but not brown. Stir in the flour and cook for 1 minute then slowly whisk in the cream until fully incorporated. Add the basil and simmer, frequently stirring, until thickened -- about 5 minutes. Season to taste with salt. Remove from heat. Remove the ratatouille from the oven and discard the parchment. Spoon half of the fresh basil cream over the top. Carefully transfer individual servings to plates and top with remaining cream if desired. 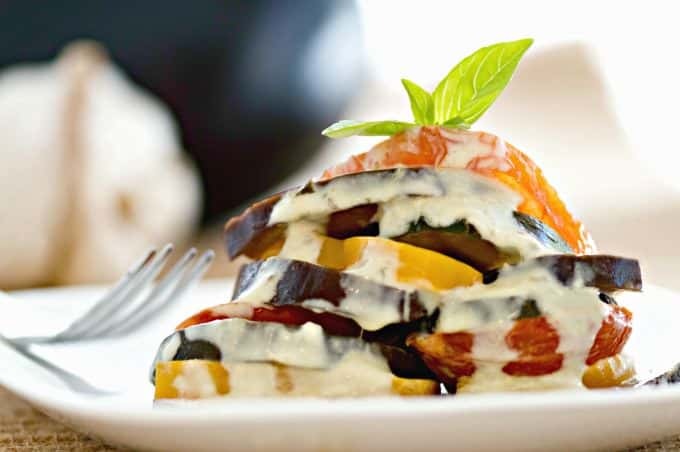 Leftover Ratatouille with Fresh Basil Cream keeps well in the refrigerator for up to 5 days and can be served warm or cold. Not a fan of reheated leftovers? You can give this a new life by adding it to sandwiches along with turkey and a slice of Munster cheese. Or get really adventurous and blend it with some Greek yogurt for a vegetable dip or cracker spread — it’s so good!